What I should have done is to have watched the original Kevin Bacon classic, a childhood favorite of mine, before having watched this film. The truth...well the truth is I never planned on watching this remake, mostly because the trailer gave me more a vibe of Step Up, rather than Footloose. I was wrong. Footloose (2011) was a sweet film, with a decent emotional core, that had some really enjoyable action set pieces. Now read that correctly, please...an action scene in Footloose, for me, is a well choreographed dance number, and of this, there were several. 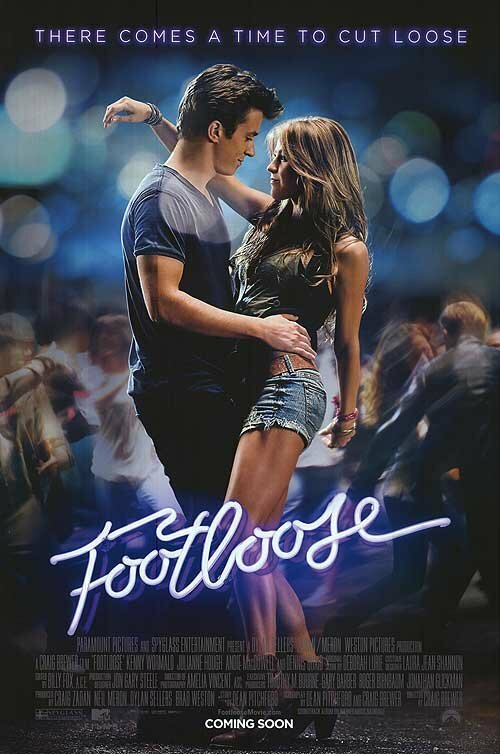 I never intended to see Footloose. I actually meant to go see The Three Musketeers 3-D, given the 3-D trailer for Attack of the Clones preceded it. You would think after 1050 movies at the theater, that I could read the times correctly, but I'm a rhino, not an elephant...rhinos can be forgetful! 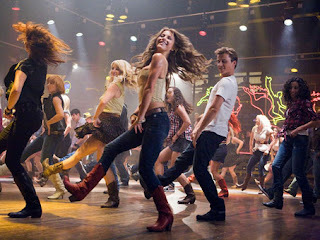 So Footloose it was and I am better for it. The film is really a standard fish out of water story, combined with a standard stranger in a strange town, outsider story...set to music. The original Footloose was a film I saw in the theater, and much like Ghostbusters inspired my friends and I to hunt the spirits roaming our neighborhood...Footloose inspired us to dance. We had roots in the breakdancing years, so making the jump to more contemporary moves shouldn't have been a problem...within a few days, we were back to headspins and backspins. You should have seen us after Karate Kid, now that was a show. All three; Footloose, Ghostbusters, and Karate Kid all came out in 1984. I was 8....it was a big summer. You should have seen the bunch of us after 1985's The Goonies...adventure was afoot plenty that summer. The acting performances were passable. Unknown actor Kenny Wormland plays Ren, just moved to Bomont, TX from Boston following the death of his mother. Ren isn't really a troublemaker, but in a town where dancing is illegal, any non-Bomontian would seem like a rabble-rouser. Wormland would be just any up and comer to me, except when checking his bio, I see that he played an unknown dancer in Kevin Smith's Clerks II. That knocks him up a notch in my book. We learn early on that five students were killed in a car wreck three years prior to the timeline of this movie. This event led to the institution of a curfew, and among other laws, the banning of public dancing by the town's youth and any playing of "disrespectful" music. 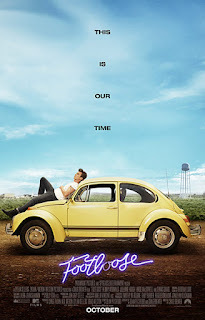 The love interest is Ariel (Julianne Hough) and the best friend role of Willard is played by Miles Teller. Ariel's brother was one of the kids killed in the wreck. Her father, the town Reverend, was played quite stoically by Dennis Quaid. As an aside, I thought that Hough and Teller were the spitting image of both Jennifer Aniston and Shia LeBouf. Also as an aside, Hough is listed as an uncredited extra from Harry Potter and the Sorceror's Stone. Zac Efron was originally slated to play the role of Ren. I am glad he did not, as his presence may have been a little distracting. Wormland was better than passable in his performance, but I mean c'mon, he's no Kevin Bacon...but few are. There are a few recognizable faces in the rest of the cast, including Andie MacDowell, Ray McKinnon, and Kim Dickens. This film has your standard love triangle and several montages, perfectly lifted from the 1980's blueprint for this type of film. The music was good, but not as memorable as the original, but in a turn of homage, all of the best songs from the 80's classic, were organically integrated into this film. That was a surprising and very welcomed aspect of the film. An enjoyable film, I give Footloose 4 of 5 horns. Given this film had a Tomatometer score hovering around 80%, I entered the theater with high expectations. I think I like this movie more in hindsight, much more than in the first few minutes after walking out of theater. But don't put too much stock in that, as I have decided to upgrade PA 3 to a 2.5 from a 2. This is a barely passable offering as a horror movie. There were some good jump scares, but for 88 minutes running time, it seemed to take way to long to get into the meat and potatoes of the mythology. Everything were simple scares until the last few minutes of the films. And what you learn in those last few minutes, seem highly unlikely give you know exactly the fate of these two young ladies. That's right, if you didn't know it, this film it a prequel. It covers a period of time in the young lives of Katie and Kristi Rey, the two fated heroines of the first two flicks. An interesting aside is that the directors for this film were none other than Henry Joost and Ariel Schulman, the directors of the 2010 documentary hit, Catfish. Catfish was one of my favorites of last year and I stand by you should watch it, just don't check out anything about the movie before you see it. The description by the critics of the film's Hitchcockian feel was accurate. But the past is the past, and what have you done for me lately? Jost and Schulman were logical selection as the lead male in PA 3 was as much obsessed with filming their day to day lives as the pair was filming Nev Schulman in his romantic endeavors as was pursued by his Facebook girlfriend. 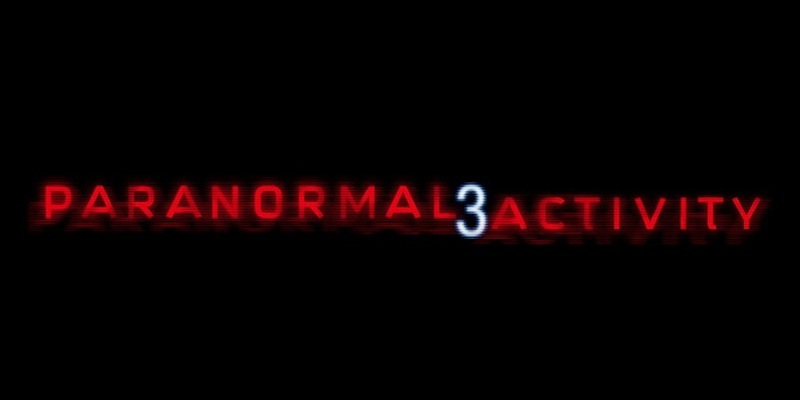 Paranormal Activity 3 is a lackluster film that is good for jump scares only. If you haven't seen the first two, it won't matter. It will help give some context, but not much. I am told they are planning a total of five movies, and for now, they are left with a tough choice...do they stick with the found footage approach, or do they flip over to studio films. It didn't work for Blair Witch...the original Blair Witch is a cult classic...yes, it only holds up for one viewing, but it is effective. Blair Witch: Book of Shadows was an atrocity. It's a tough choice, but to make these worth watching, it may take more than adding a tradition shoot to pull it off. As an aside, as a Maryland Terrapin, the first time I saw Blair Witch on an unmarked VHS tape making the bootleg rounds around campus, long before the first ad for it hit newsstands or theater previews. It was scary as hell, and for all we could have known, it may have been real. That's one helluva way to watch a flick. 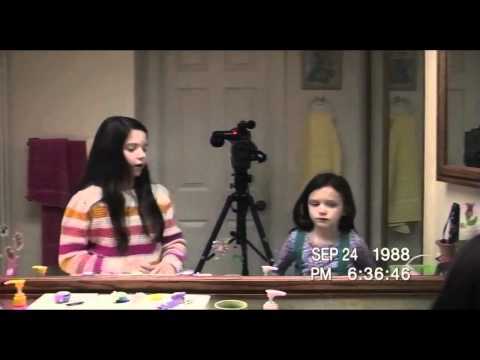 I don't think Paranormal Activity will be able to turn it around...but you know that I'll be there to figure it out. 2.5 of 5 horns. Mediocre at best.